Email is the most popular (and by many counts, the most successful) of all online marketing channels, but it’s role and best practices are changing dramatically and rapidly. The excellent David Daniels, analyst for JupiterMedia (recently purchased by Forrester) wrote a report in July on “The Social and Portable Inbox” that underscores how the game has changed. Increasingly, consumers are using text messaging, online messaging via social networks, and instant messaging for communication. 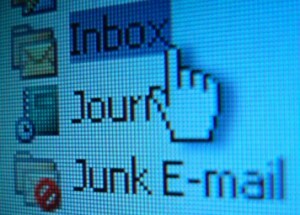 In fact, according to Jupiter, the average number of emails received per day is 24, down from 41 in 2006. Nobody I know gets 24 emails a day or fewer, but that’s what the research says. Personally, if I could get as few as 24 emails per day, it would leave me time for that Emu farm I’ve been pondering. And even though people are getting less email, they’re checking it more frequently. According to a new report by AOL, 51% of users (and this is AOL, not the most tech-savvy audience) check their email 4 or more times per day. There are very few other things I do 4+ times per day. Because people are using other tools to communicate, Email is becoming the new direct mail. A series of come-ons, one time onlys, you could be a winner, and so forth. Granted, according to Jupiter 44% of email recipients (which is nearly every non-incarcerated human) made at least one online purchase in the past year as a result of promotional email. (interesting side note: 41% made at least one OFFLINE purchase due to an email promo). However, those buying rates are down a bit from 2007, and I fear they will continue to slide. Why? Because companies (and especially their agencies) don’t understand the changing nature of email communication. Here are 4 rules to follow to make sure your email isn’t immediately deleted. 1. One size doesn’t fit all. The worst emails (and in my experience, the least successful) are those that assume all customers have the same needs and circumstances. If you’re sending the same email to your entire list, your email program is severely challenged. Segment your list in as many ways as possible (gender, when they joined the list, how they joined the list, purchase history, propensity to click through) and then develop specific, highly relevant messages for each audience. Is it more work? Absolutely. But, it will almost assuredly pay off for an e-commerce or promotional email campaign. 2. Get right to the point. Most email is scanned in the preview pane, and not “read” in the classic sense at all. Far too many emails – especially those built by professional designers – have substantial amounts of photos, icons, intro copy etc. with the actual offer and call to action toward the middle or bottom of the email. Big mistake. State your offer immediately, and then restate it at the middle and end of your email. 3. It’s not a Web site. If somebody cares enough about you to be on your email list, they’ve already been to your Web site. You don’t need to include multiple links back to your site in the header of your email. It just gets in the way of the content. Plus, when read on a mobile device (16% of the population does so according to AOL, and the numbers are soaring), when an HTML email renders, it stacks all navigation labels first, and then shows the body of the email. This pushes your offer WAY far down on the Blackberry, and nobody is going to scroll page after page on a Blackberry to see your offer. Making sure you have a solid, tested text-only email version is critical as well. 4. Ditch the pictures. Increasingly, email software turns images off as a default, including these popular programs: AOL 9, Gmail, Hotmail, Mozilla Thunderbird, Outlook 2003, Outlook 2007, Outlook Express 6, Windows Live Mail. Consequently, many recipients of your email may not see your snappy custom graphics at all, they’ll just see a blank box. Agencies are especially guilty of creating emails in Photoshop or Illustrator and coding them as a single image. This is absolutely the kiss of death for modern email. Don’t do this. Instead, create an email without images first. This makes you emphasize convincing copy. Then, add selected images and code them as individual graphics. All text should be HTML, not graphics. Make sure you have descriptive alt text for each image that will display when images are turned off. Lastly, a fantastic idea for both images off and mobile device scenarios is to describe your email and your offer in small HTML text above your logo. We tested this approach for a client at Mighty Interactive, and increased sales by 65% from only this one tweak. 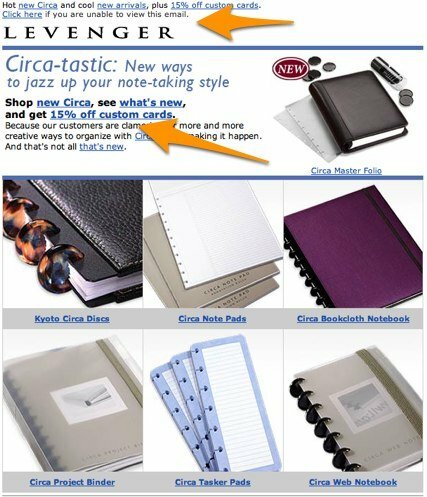 The email below from Levenger is rock solid. – It uses the above the logo call to action. – It doesn’t use needless Web site navigation. – Images are coded separately, and have alt tags. The biggest fallacy in email marketing is that emails have to be “beautiful” to be effective. That thinking creates emails that look and act like a poster, and given the trends, that’s the exact opposite of what agencies should be doing for their clients.